Movement to Work is a voluntary collaboration of UK employers committed to tackling youth unemployment through provision of high quality vocational training and work experience opportunities for young people. CEO Summit and Awards on 4 February 2019 that its employer members, including FTSE 100 companies and SMEs, have delivered 80,000 work placements over the last five years, for young people who are not in education, employment or training (NEET). MtW is a collaboration of UK employers committed to tackling youth unemployment through the provision of high-quality work experience and other work opportunities. The 80,000 work placements have been made possible by employers, charities and Government working together through MtW. Collectively they have provided young people with diverse and empowering experiences ranging from hospitality to engineering. The placement programmes lead to tangible results for young people with more than 50 per cent of those finishing placements going back to education or into employment. The programmes delivered by the collaboration equate to an economic value to the UK of over £1bn over the five-year period, with young people moving into employment no longer claiming benefits, paying tax and spending their pay. Alok Sharma, Minister of State for Employment, said: “The overall UK employment rate is at an all-time high, with more people in work than ever before, and youth unemployment has almost halved since 2010. But we cannot be complacent and I am determined to ensure that we make further progress to ensure that every young person has the opportunity to benefit from a stable job. 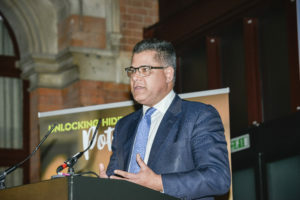 Ivan Menezes, chairman of Movement to Work and chief executive of Diageo, said: “We believe in the potential of all young people and know that by providing placements and other opportunities that lead to meaningful work, we can support young people to fulfil their potential. Meaningful employment is key to their wellbeing, enables them to contribute to their communities and brings prosperity to so many. Employers working with MtW have recognised that recruiting in this way makes both ethical and financial sense through lower recruitment costs, the enhanced loyalty of placement graduates, improved morale of existing staff and the ability to build in-house talent through training. Employer members include Accenture, BAE Systems, Barclays, BT, BUPA, Centrica, the Department for Work and Pensions, Diageo, HSBC, IBM, Marks and Spencer, Marriott International, NHS, Tesco, Unilever and Wates, amongst others.